Chris "HuK" Loranger is a Canadian StarCraft II player. 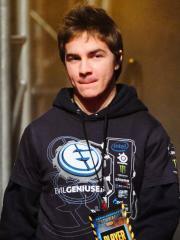 At present, HuK is ranked #655 in highest overall earnings, and #18 in highest earnings for players from Canada. Out of the 117 tournaments awarding cash prizes that HuK had competed in, the largest amount was $15,726.86 from DreamHack Summer 2011 (StarCraft II) on June 21, 2011. He placed 1st, making up 10.36% of his total prize money won. HuK overtook the $100,000 milestone on July 6, 2014, winning $2,000.00 and placing 17th-24th at WCS North America 2014 Season 2 Premier. Prize money from 72 tournaments got him to that point. HuK has contributed to the competitive scene of the following games outside of competing in tournaments.